Audi, one of the leading international luxury automobile brands plans to introduce the third generation of the Allroad Quattro series. The brand new Audi A6 Allroad Quattro 2012 will offer improved fuel efficiency and better performance than its previous models. Under the hood, the Audi A6 Allroad will offer four different engines, 3 TDI units and one TFSI gasoline engine unit coupled to a turbocharger. A major advancement over the previous model is the reduction in fuel consumption by almost 20 per cent through the incorporation of technologies like thermal management and the innovative coasting system. An important plus point is that the three 3.0 liter TDI units generate power outputs of 204 HP, 245 HP and 313 HP and provide an impressive mileage of 38.56 miles per gallon. The 3.0 liter TFSI gasoline unit generates a power output of 310 Horsepower and it allows the A6 Allroad to attain a maximum speed of 250 kilometers per hour. The A6 will face stiff competition from BMW X5 and Mercedes-Benz GL 550 in terms of performance and price. The car body of the Audi A6 will be made from strong lightweight materials like Aluminium in order to reduce the weight of the car. The car comes with Xenon plus headlights that illuminate the road properly when integrated with adaptive light technology. The customers can also opt for the highly distinctive progressive LED package for the tail and headlights. The car interior also boasts an elegant and luxurious design and generous use of aluminum for inlays and sill trims. A major plus point of the A6 Allroad Quattro is the innovative restraint system that is highly efficient in lowering the risk to the passengers in the case of accidents. 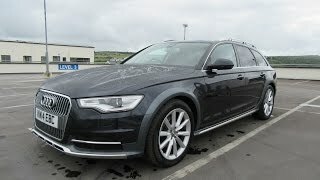 The Audi A6 Allroad Quattro is expected to hit the German markets sometime in spring 2012 and will be priced at around 54000 euros for the base TDI model. The first two generations of the allroad quattro from the years 2000 and 2006 were winners, and Audi hopes to build on this success with the third generation. Universally talented, the new A6 allroad quattro extends the range of uses for the A6 Avant because when the asphalt ends, it just keeps on driving. Performance has improved and fuel consumption has been reduced by as much as 20 percent compared with the previous model. The new A6 allroad quattro is 4.94 meters (16.21 ft) long, 1.90 meters (6.23 ft) wide and 1.47(4.82 ft) meters tall, making it a few millimeters bigger than the Avant. It follows the Audi ultra lightweight construction principle familiar from the sedan, with aluminum components making up roughly 20 percent of its body. Total vehicle weight has been reduced by as much as 70 kilograms (154 lb) compared with the previous model. The Audi A6 allroad quattro has a sportily distinctive road stance. It features balanced proportions, sharp lines delineate taut surfaces and the roof line flows into flat D-pillars. Audi offers progressive LED technology as an option for the headlights and tail lights. The xenon plus headlights can be combined with adaptive light, which ensures that the road is always properly illuminated for the situation at hand. The body of the new A6 allroad quattro sits six centimeters (2.36 in) higher than that of the A6 Avant. Setting it apart are, in particular, the trim strips on the side sills, the more widely flared fenders and the single-frame grille with vertical slats. Stainless steel covers protect the underbody at the front and rear of the car, and the exhaust system ends in two large, flattened tailpipes. The roof rails are mounted on double bars. The wheel well edges, the bumpers and the sills are painted in a contrasting color. Audi also offers a full paint finish in combination with the optional aluminum exterior package. The color Java Braun is available exclusively for the new A6 allroad quattro. The interior of the Audi A6 allroad quattro offers plenty of space thanks to the long wheelbase of 2.91 meters (9.55 ft). It features a lean, elegant design, exemplarily clear ergonomics and superior workmanship. A function that depicts the car’s pitch has been added to the MMI operating system, the soft keys of which are gleaming aluminum. MMI comes as standard, as does the onboard computer with efficiency program. A comprehensive package of restraint systems helps to mitigate the consequences of an accident. The luggage compartment of the new A6 allroad quattro has a capacity of 565 liters (19.95cuft). Latches in the luggage compartment make it easy to fold down the rear seats, increasing luggage capacity to 1,680 liters (59.33 cu ft). Standard equipment features underscore the practical character of the new model – a rail system with an included load-securing kit for dividing the luggage compartment as needed, tensioning straps on the left wall and a double loading floor. Audi offers a broad choice of options for the new A6 allroad quattro. The head-up display projects important information onto the windshield. Ambient lighting bathes the interior with subtle LED light, and the widely adjustable deluxe front seats are optionally available with a ventilation and massage function. Additional highlights include four-zone automatic air conditioning, a panoramic glass roof and the convenience key, which can stay in the driver’s jacket pocket. Topping the modular range of infotainment options is the hard drive-based navigation system MMI Navigation plus with touchpad operation (MMI touch) and whole-word voice control. Its power-retractable eight-inch monitor displays extremely sharp, high-contrast images. The Bang & Olufsen Advanced Sound System boasts 15 speakers. The new A6 allroad quattro is also state of the art when it comes to connection technology. The optional Bluetooth car phone online connects it to the Internet via UMTS, and a WLAN hotspot lets the passengers surf and e-mail. Tailored services for the driver, such as the all-new Audi traffic information online or Audi music stream web radio, are delivered right to the car. Attractive services from Google, including Google Earth, Google Street View and voice-activated POI search, are also available. The Audi assistance and safety systems lend even more confidence to driving. The radar-based adaptive cruise control with stop & go function always keeps the new A6 allroad quattro at the proper distance from the car ahead. At speeds below 30km/h (18.64 mph), the system initiates maximum braking in the event of an impending collision. ACC stop & go works closely together with the Audi pre sense safety system, which is available in a number of configurations. Audi active lane assist helps the driver to maintain the lane; Audi side assist helps when changing lanes. The night vision assistant with marking of detected persons reduces the stress of driving in the dark. The driver information system with rest recommendation function detects when the driver is getting tired and recommends taking a rest. A variety of high-end systems help take the stress out of parking. The park assist system with 360° display takes over the steering; the parking system plus with 360° camera provides good vision in all directions. Four small wide-angle cameras record images of the vehicle’s immediate surroundings, which can then be displayed from a variety of perspectives on the MMI monitor. The new A6 allroad quattro is available with a choice of four powerful and highly cultivated V6 engines – one TFSI gasoline engine and three TDI units. All are three-liter engines with turbocharging and direct injection. They make use of important technologies from the Audi modular efficiency platform – the start-stop system and innovative thermal management. Their fuel consumption has been reduced by as much as 20 percent compared with the previous model. The 3.0 TFSI, which is boosted by a mechanically driven compressor, produces 228kW (310 hp) and 440 Nm (324.53 lb-ft) of torque. It accelerates the A6 allroad quattro from zero to 100 km/h (62.14 mph) in 5.9 seconds on the way to a electronically limited top speed of 250 km/h (155.34 mph). It consumes 8.9 liters of fuel per 100km (26.43USmpg). The three variants of the 3.0 TDI produce 150 kW (204 hp), 180 kW (245 hp) and 230 kW (313 hp); torque values are 450, 580 and 650 Nm (331.90, 427.79 and 479.42 lb-ft). The entry-level version consumes on average just 6.1 liters of fuel per 100km (38.56 US mpg), corresponding to 159 g CO2/km (255.89 g/mile). Audi will soon offer a particularly low-emissions clean diesel version of the 180 kW (245 hp) engine. The twin-turbo 3.0 TDI developing 230 kW (313 hp) is a powerful, great sounding engine. 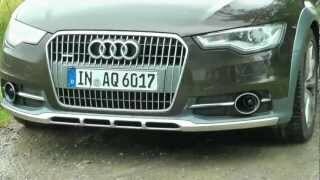 It accelerates the A6 allroad quattro from zero to 100 km/h (62.14 mph) in 5.6 seconds; the top speed is an electronically regulated 250 km/h (155.34 mph). The most powerful TDI delivers its power to a smooth and fast-shifting eight-speed tiptronic transmission. The three other engines are paired with the seven-speed Stronic, a sporty dual-clutch transmission. With their wide ratio spreads, the automatic transmissions are major contributors to the efficiency of the A6 allroad quattro. The driver can operate them manually, including via optional paddles on the steering wheel. The quattro permanent four-wheel drive system is paired with torque vectoring. During dynamic driving this system brakes the wheels on the inside of the curve, which are under a reduced load, before they can slip. This further enhances traction and handling. The optional sport differential distributes the power in continuously variable proportions between the rear wheels. The chassis of the A6 allroad quattro combines sportiness with comfort. The new electromechanical power steering is sensitive and highly efficient. The optional dynamic steering adjusts the steering ratio to the speed driven. With the Audi drive select system, the driver can vary the function of the steering, the air suspension, the gas pedal, the automatic transmission, the sport differential, the automatic air conditioning, the lighting and the adaptive cruise control. In Efficiency mode, these systems work as economically as possible; their function can be very freely configured in Individual mode. The adaptive air suspension, which combines air suspension with controlled damping, comes as standard. It lowers the body by 15 millimeters (0.59 in) at high speed and raises it by 35 millimeters (1.38in) at the push of a button. This allroad mode is suitable for rough terrain. Furthermore, the driver can select a lift mode at low speeds. An additional ten millimeters (0.39in) enables the new AudiA6allroadquattro to also handle major irregularities in the road surface. The Audi A6 allroad quattro rolls on 18-inch, five-arm alloy wheels and 235/55-size tires. Audi and quattro GmbH offer optional wheels measuring 18, 19 and 20inches in diameter. The large brakes provide powerful deceleration. The driver can activate a hill descent assist function for steep downhill passages. This limits the speed to between 10 and 20 km/h (6.21 and 12.43 mph), depending on the surface. The new Audi A6 allroad quattro will be available in Germany from spring 2012. The 3.0 TDI developing 150 kW (204 hp) has a list price of €54,600.